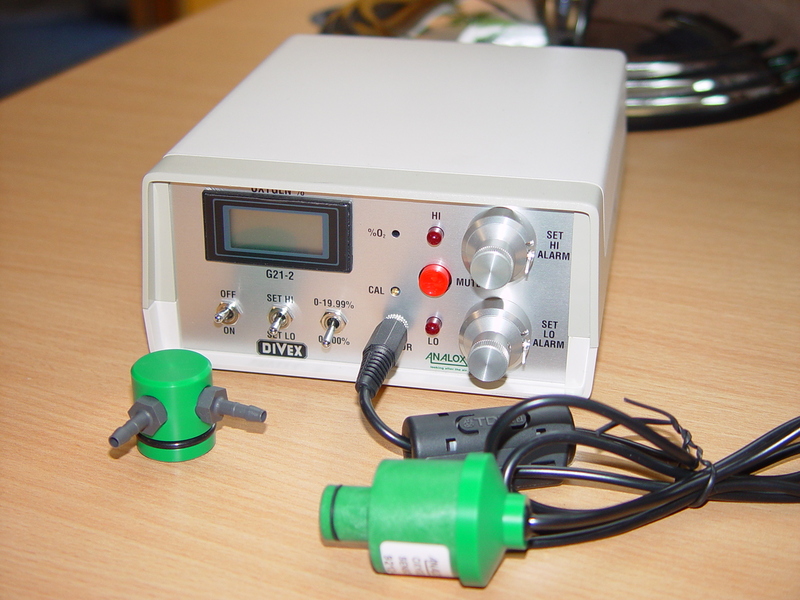 Temperature compensated, the Divex G21-2 oxygen analyser provides users with a reliable and quick response. The G21-2 analyser monitors oxygen concentrations ranging from 0.00 to 19.99% and 00.0% to 100%. Typical applications include monitoring the gas supply to a recompression chamber or O2 level in the chamber and general testing of O2 levels in cylinder gases. The remote sensor is connected to the monitor by a 3 meter lead, and the ABS case makes it highly resistant to impact. 2 high intensity LEDs and an audible alarm will signal when the oxygen level is outside preset limits. Mute switch enables audible alarm to be silenced but the appropriate LED will remain on until the oxygen level is within the limits.